Costs – Learn about the average cost of tree maintenance, removal and stump removal in Naples, Florida. FAQs – While it’s not Naples, Italy, the Florida town has a sprawling tree-scape that thrives depending on how well it’s cared for. See what diseases to be aware of, which fruit trees to plant and more. Services – Professionals work every day to make residential trees spring higher to the sky. Call one for your trees. How Much Do Tree Services Cost in Naples? 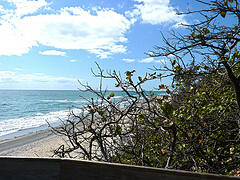 In Southern Florida, and along the coast in particular, maintaining your property can feel like a lot of work. In Naples, the temperatures are warm throughout the year, and the humidity makes the perfect environment for trees to grow. Whether you are unsure about how to prune a tree or you want to mix up your landscaping, this guide can help you know what to expect when it comes to hiring professionals for tree maintenance. If you want to have a tree completely removed in Naples, you should expect to pay between $461 and $663 for the job to be done by professionals. This team will come in and tether the tree with a rope to ensure that it comes down safely, and they can even cut up the trunk for you to use as firewood if necessary. To have the wood removed from your property, you might see an increase in the total cost. What Does Stump Removal Cost? To have a stump removed by professionals in Naples, the average cost is between $80 and $134. This includes the cost of bringing a 300 pound stump grinder onto your property and using gasoline to power the task, which should take less than 15 minutes for even a large stump. What Does Tree Maintenance Cost in Naples? Once a year, it is a good idea to prune tree branches or have them trimmed away from any structures on the property. You might also want to hire professionals to fertilize trees or check them for pests. While the cost of tree maintenance varies on the number of trees and the job you have in mind, expect the average price to be roughly $351. Even with the significant development that Naples has had over the past several decades, the area still retains a lush, green feel. This is due in large part to the climate, but it is also influenced by city tree removal regulations and an effort to keep the city green. Discover everything you need to know about tree care in Naples, choosing the right trees to grow and any regulations that might apply to your property. In an effort to keep the city’s canopy in place, Collier County has established a process of tree maintenance. Before removing a tree in the city, you should apply for a permit. However, single-family homes on single plots of land that are less than one acre in size do not have to adhere to this regulation. Commercial properties, the trees on public land and large residential areas will need to get a permit, and permits are only granted if the land has a minimum number of trees in place already. Whether you are deciding what new trees to plant in your yard or you are worried about branches getting to close to the power line, the best course of action is to ask what the experts have to say. In this case, the Naples overhead power line experts are FPL, or Florida Light & Power. The FPL maintenance crews periodically trim branches that could damage power lines, but homeowners should avoid planting tall trees near lines when at all possible. If you want to look beyond the area’s native trees, it is important to think carefully about the hardiness zone of any tree you plan to plant. Naples is classified by the United States Department of Agriculture as a destination with a 10a rating, which represents that region’s tropical climate. Therefore, any trees with ratings below 7a will likely wilt in the heat and require excessive water. Those with rankings as close to 10a as possible, on the other hand, will likely be able to thrive. In 1953, the sabal palmetto was selected to be the official state tree in Florida. This tree is native to the area, and it is so common that it was even included on the state’s quarter in U.S. currency. The sabal palmetto also goes by names like the cabbage palm and swamp cabbage, and it is found in abundance in Naples as well as throughout the rest of the state. If you want to grow fruit trees, Naples is a fantastic place to do so. The near-tropical climate means that many fruit trees thrive in the environment, and you will have a wide selection of choices to pick from. Some of the most common choices include loquat trees, mangoes, bananas, lemons, oranges and a whole range of other citrus trees. The American Forests organization maintains extensive records on the tallest trees found throughout the nation. 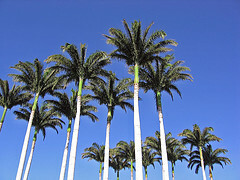 Collier County, home to the city of Naples, boasts the country’s tallest Roystonea regia, or royal palm tree. Located along the Fakahatchee Strand, this tree stands at 82 feet in height. If you are looking for trees that are under four feet tall in maturity, great options for Naples include the weeping bottlebrush, oleander and Geiger trees. In Naples, as in most environments, trees are susceptible to diseases and insects that can do substantial damage. Some of the biggest threats to regional trees include Fusarium wilt, which is a fungus that can harm and even kill palm trees, rust disease, emerald ash borers and gypsy moths.